Do Jack Russell Terriers Like to Dig? Dogs like us, baby, we were born to dig. Jack Russell terriers don't just like to dig, they were bred to do exactly that. It's not something you can truly train out of the breed, although you can try. If you can't stand a dog who digs or barks frequently, consider another breed. Otherwise, enjoy. Jack Russels make super AKC Earthdog competitors. Jack Russell terriers are tough, confident, scrappy little dogs. They might be small, but they aren't lap dogs by any stretch of the imagination. Your JRT can be brave to the point of foolhardiness. They're game, intense little dogs with an almost preternatural instinct for getting into mischief. JRTs mature between 10 and 12 inches tall at the shoulder. Your JRT has a weatherproof coat, whether it's smooth or rough. While the breed can have any color markings, according to American Kennel Club standards a Jack Russell must be a minimum of 51 percent white. Yes, dear reader, there really was a Jack Russell. He was a divinity student at Britain's Oxford University in the 1800s. That's why a similar type of dog, long recognized by the AKC, is called the Parson Russell terrier. The good reverend lived to fox-hunt and developed the breed that bears his name from fox terriers, Manchester terriers and other hunting dogs. These dogs were bred for working quarry, a trait their descendants strongly retain. In the field, they would go underground, following the quarry's scent and barking. They'd keep this up until their prey bolted or a hunt member dug it out. They are also used for general pest control. If you've got rats in your barn, a JRT is far more effective than felines. It's important to socialize your JRT and take him to obedience classes. He's extremely independent, energetic and feisty, so good training is necessary with this breed. Make sure you have a secure, fenced yard -- remember, he's a digger and can get under fences that might hold in the average dog. Because he's determined and fearless, he's likely to go through an electronic invisible fence oblivious to the shock. Bred to hunt, he's as likely to go after a cat as any wild animal. Think twice about bringing a JRT into your home if you have cats, other dogs or small pets. The Jack Russell Terrier Club of America strongly recommends crate-training your JRT, noting, "They can be very destructive if left unattended." Any Jack Russell owner will confirm. This dog needs a job and plenty of exercise. 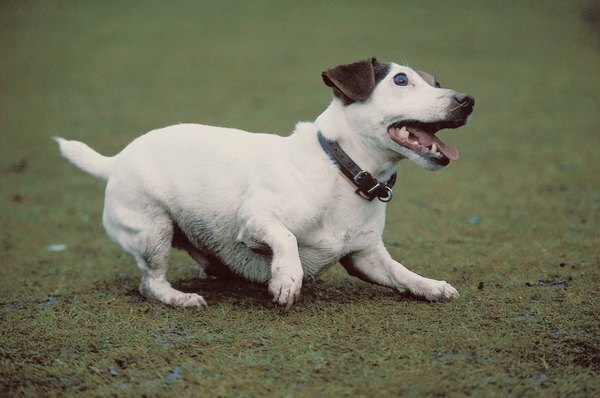 Earthdog competitions allow JRTs and similar breeds bred to hunt vermin to do what comes naturally. The AKC recognizes three levels for Earthdog testing: junior, senior and master. Before your JRT can compete in any of those tests, he must undergo quarry introduction. According to the AKC, a rat trail scent is laid down into a 10 foot tunnel, at the end of which are caged rats. The dog is introduced to the tunnel, which has a right-angle turn. The dog "works" the rats, by barking, digging, lunging or any work that the judge decides indicates a desire to get at the quarry. As he moves up the Earthdog testing levels, the tunnels get progressively longer with additional turns, and the dog must work the rats within a specified time, then allow his handler to safely remove him. If you've ever seen a JRT go after prey, you know that safely getting him away from it is no picnic. National Working Terrier Federation: So What is Terrierwork? Why Does My Jack Russell Terrier's Hair Keep Falling Out?